Virtually every day for the last month I have listened to the same song. That’s not surprising you say…over Christmas the shops are filled with Slade or Paul McCartney endlessly singing the same festive tunes. Every day, almost without fail, Hazel, who is largely non-verbal and has very little language as yet, has been singing. The same song. Over and over. Every time the lights on the Christmas tree were switched on, we heard it. Every time a candle was lit to freshen up the house after a meal, we heard it. Every time a visitor called by to offer festive greetings, we heard it. Even in the Doctor’s tinsel clad waiting room, poorly and struggling with yet another infection, we heard it. Hazel has no idea what Christmas is all about. Not really. That will come in time. She did not write a list for Santa, or even hang up her own stocking. She had little interest in opening presents – finding it all too overwhelming, instead shuffling off to find a quieter space. Not even a morsel of Christmas fare passed her lips, as she happily ignored all food yet again, content to let a tube keep her alive. But she knew it was special and that was enough for me. Like her birthday, last September. Special. Not that she understands birthdays either. But she remembers being celebrated with a special song. Hazel understands being special. Not in the way some people use the term ‘special’ either – for all children are special. With or without an extra chromosome. She is special because she is Hazel. She is planned and purposed. She is loved and wanted – but even if she weren’t (God forbid) she would still be special. She is special because she is a human being, made in God’s image. She is special because. Last year I, along with many others spent time and energy campaigning for the unborn – in particular those who are found pre-natally to have Down’s syndrome. We argued that their lives are worth living. That their lives are as worthy as yours or mine. I would be dishonest if I didn’t admit that, at times I felt crushed by the campaign. I’m sure others did too. In reality, it was the attitudes I came up against that brought me low on more than one occasion. Imagine having to justify your child’s existence – I did when a journalist asked me to explain why it was better that Hazel was alive and not an abortion statistic. I have found it difficult to even write about these things since the campaign reached its height – around the time of Sally Phillip’s excellent documentary A World Without Down’s last October. I’ve wanted to hide away from the reality of living in a world that is so hostile to people with Down’s syndrome. I have felt it personally. I have felt the hostility and the hatred. I have felt it for my little girl. I have cried many tears for Hazel and the discrimination she faces from those who think our society would be better off without people like her. We’ve kept our decorations up a little longer than usual – for Hazel. She loves them so much. And, as she sang Happy Birthday to herself this afternoon, she reached me. So at the start of a New Year I want to celebrate my little girl with an extra chromosome. She celebrates herself every day after all! So why shouldn’t I? Why shouldn’t the world celebrate with her and all those like her? I will not hide away and stick to damage limitation. I will stand up and fight for her and for all those who have no voice. When she sings the one song she knows so well, I will not correct her and tell her it’s not her birthday (even though it isn’t!) Instead, I will sing it with her, as often as she wants to. Happy birthday Hazel – I will celebrate your very existence and that of your equally special sister each and every day! Categories: Abortion, Acceptance, Down Syndrome, Down's Syndrome, Faith, Joy, Parenting, Trisomy 21, Uncategorized | Tags: #celebrate, #dontscreenusout, #downsyndrome, #Happy Birthday, #NIPT, #Trisomy21, Acceptance | Permalink. Afraid. What does the future hold? Will my children be safe? These are questions I’ve noticed many parents are asking on social media lately. So much to be afraid of. Acts of terror creep ever closer to home. Paris. Long awaited trips to Disneyland being viewed rather more anxiously. Life just got a whole lot more scary. And yet for the parent of a child with additional needs these fears are already known only too well. They have loomed large since the day they were given a diagnosis. Afraid. What does the future hold? Will my child be safe? Like me, they stare over their sleeping child and ponder these things. Watching them breathing deeply and securely in their cot or bed. Smiling at the way they are lying or the way they are clutching onto a favourite blanket or teddy. Thoughts so quickly turn to the future. Who will take care of her when I am gone? Will anyone love her – really love her as I do, when I’m gone? Will she be bullied because she is different? Because she has Down’s syndrome? Will she be exploited? Taken advantage of? Who will speak kindly to her when she is anxious or sad? Who will hold her hand or give her a hug? It’s not uncommon for many parents of children with disabilities to even wish that they outlive their child. They cannot see a future for their child without them being there to care for them. It’s these fears that threaten to overwhelm me. Blink fast, swallow hard fears. But they only ever threaten me. I’m a Christian. Completely not cool. According to the media and especially social media, I am someone to be mocked. Often laughed at, ridiculed, criticised and increasingly silenced. I can live with that because my faith is the only thing that can calm these overwhelming fears. The media can’t. Facebook can’t, neither can Twitter. Other people can’t, though of course I take huge comfort and encouragement in the words and experiences of others on a similar journey, whether or not they share my faith. I am thankful for them and value them enormously. But, if having faith is a crutch to lean on then I am happy to keep limping. However uncool it may be. The Bible has two particular things to say about Hazel ‘s life. They are my crutches. Whenever those fears threaten to overwhelm me once more I bring them to mind and lean heavily on them. Firstly that God uses the weak things of this world to shame the strong. Down’s syndrome is often seen as weakness. A flaw. Something undesirable. Something to be got rid of. Unwanted. Not to God. And not to me. I have already seen how Hazel’s ‘weak’ life compares to the selfish, self centred lives of many ‘stronger’ or ‘wiser’ people. She has already brought more joy into our lives in four short years than some people will bring in a lifetime. She shames many. Each and every day. Secondly, that God has plans for her life. Plans to prosper her and not to harm her. Hazel’s life is no accident. She was planned. She has purpose. She has a future. This doesn’t mean there won’t be problems, or challenges. This doesn’t mean she won’t face discrimination or even hate. But it does mean that her life will matter. Her life will make a difference. Her life will be cherished and she will be loved. I believe what God says. I have to. The alternative is too overwhelming for me. Holding tightly onto my faith. Stamping out those fears as I go. Categories: Down Syndrome, Down's Syndrome, Faith, Joy, Uncategorized | Tags: #downsyndrome, #fear, #fears, #prayforparis, #team21, #Trisomy21 | Permalink. Shopping lists and signing for deliveries has been the extent of my writing achievements lately. Weeks of Hazel’s poor health and the sudden serious illness and subsequent loss of one of my dearest friends has stopped me in my tracks. And, though the words have not come so easily, I have at least had some time away to stop and reflect. Last week we found ourselves on an almost empty beach, having arrived late in the day. The sun was casting long shadows across the beach and the sand was still warm underfoot. Hazel loves the sand. Did I say she loves the sand? She LOVES it! The moment we placed her down on the picnic blanket she was off. At speed. For a child that cannot walk or even stand unaided this was a sight to behold as she bottom shuffled away across the beach. Arms raised as she went; chasing after the long shadow her tiny frame was making in the evening sun. Have you ever seen the tracks that are made in the sand by baby turtles as they head for the sea? With all their might they propel themselves forward, their little bodies longing to be in the water where they swim freely. A trail of wavy lines in the sand; evidence of their struggle and determination to reach their destination. Hazel left similar tracks as she crossed the sand. Before we arrived at the beach we had been in a children’s play area. I generally hate play areas. Mostly because they are a reminder to me of what both my children can’t do. My eldest has her own physical struggles with hypermobility. Play equipment has been a huge challenge for her, not least because most of her friends can use it with ease. In Hazel’s case it is often simply inaccessible. Though some playgrounds are more disabled friendly than others, largely their equipment is off limits to her. Yet here, in the sand, Hazel had freedom. She was not hindered in any way. It didn’t matter that she could not run or walk or even stand up on that beach. Hazel took enormous pleasure from what she could do, from all she could enjoy in her own unique way. She didn’t need toys. 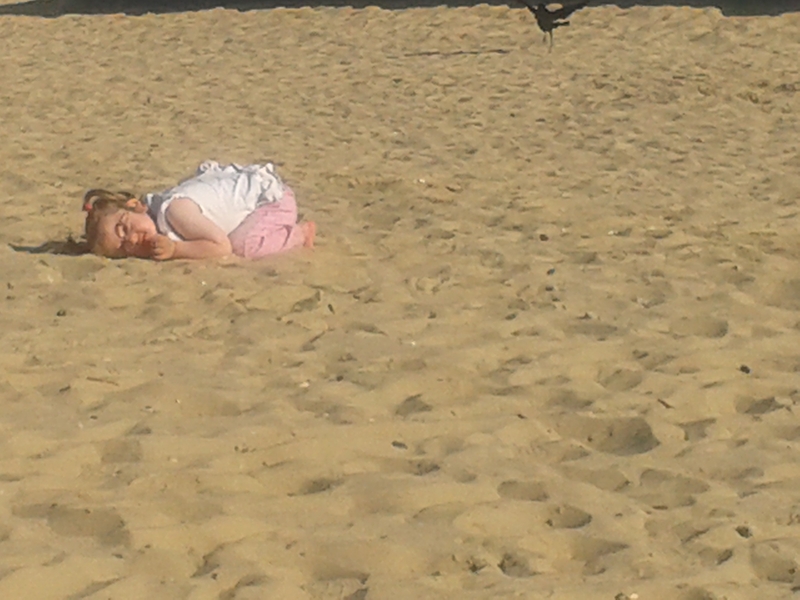 A bucket and spade was of no interest to her. The feeling of the sand in her fingers and toes was enough to keep her attention – for hours! She did not tell us how much she was enjoying herself. She can’t do that – at least not verbally. But the joy on her face and the fact she did not turn back for reassurance told us all we needed to know. Hazel was happy. She had all she needed. Hazel does not eat food. She is tube fed. Food holds no interest for her – yet. But sand….sand would go into her mouth quite happily. And, by the time we left the beach later that evening, she was literally covered from head to foot. Almost camouflaged. The turtles eventually reach their destination, though it is a perilous journey, full of struggle. They don’t give up. And, once there, they swim freely. Hazel will eventually reach her destination. She will eventually walk, she will eventually eat. She will eventually talk – even this week she had made advances with this. I, on the other hand, have felt like giving up recently. Too many sadnesses and difficulties to face. I haven’t wanted to keep going. Yet Hazel, as ever, is my little joy giver. It’s hard to stay sad when she is around. And she teaches me so much about perseverance and courage. Hazel doesn’t give up. She chooses joy and is content with simple pleasures. My dear, precious friend, Vicky, for whom I, and so many others, now grieve, made it across the sand. She reached her destination – far sooner than any of us would have wanted or expected. She knew where she was going and lived her life in the light of it; constantly urging others to make their lives count. Her faith in God permeated every part of her life. Heaven was so real to her, and, when the time came, I don’t think she was afraid to go there. The tracks she has left are permanent ones. Life changing even. I thank God for her, but I miss her so very much. Hazel is a little further across the sand this week. And so am I. In memory of Vicky Taylor, who made every second of her one precious life count. 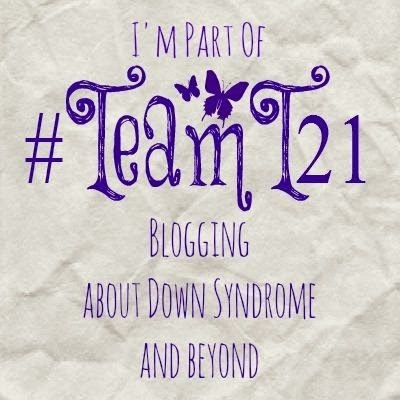 Categories: Down Syndrome, Down's Syndrome, Faith, Joy, Trisomy 21 | Tags: #downssyndrome, #downsyndrome, #faith, #Team 21, #team21, #Trisomy21 | Permalink.